Does the challenge of working at the top-end of the international arena motivate and inspire you? Do you thrive in an environment that is truly international and multi-cultural? NEPOMAK, in partnership with the Cyprus Mission to the United Nations in New York, is offering a unique opportunity to eligible NEPOMAK members to experience working as an intern in the United Nations system, working closely alongside diplomatic staff. Attending and reporting on various meetings at the United Nations, including meetings at the General Assembly and the Security Council. Preparing reports to be sent to the Cypriot Government on UN-related issues. Conducting research to aid the work of the diplomats. Helping with outreach activities and other events. Be a current, registered member of NEPOMAK (it’s quick, easy and free to sign up online). Be a citizen of a European Union Member State (including Cyprus). Note – candidates resident outside of the European Union holding a European passport are eligible to apply. Hold a university degree (or equivalent) or be studying at graduate level at the time of the application. Priority will be given to candidates with qualifications in the following or related fields: Political Science, International Relations, European Studies, Law or Economics. Be available to work for at least 3 months. Demonstrate an interest in international affairs, the work of the UN and the EU. Have excellent command of written and spoken English. Knowledge of Greek or Turkish is an asset. Have excellent computer knowledge (Microsoft Office applications). Have excellent interactive and interpersonal skills, and be able to work in a multicultural environment. Short-listed candidates will be invited to interview. The application process is ongoing and applications may be submitted all year round. We recommend that candidates apply at least four months before their preferred internship start date. The internships are unpaid and participants will be required to organise and fund their own accommodation, medical insurance, and other expenses during the course of the internship. There should be no expectation of employment at the end of the internship. Visa requirements: The Cyprus Mission to the United Nations will assist selected candidates in satisfying the US immigration requirements for the duration of the internship. Spending 2 months in New York working for the Cypriot Mission to the UN has been one of the most amazing experiences and I feel so lucky to have had such an opportunity. 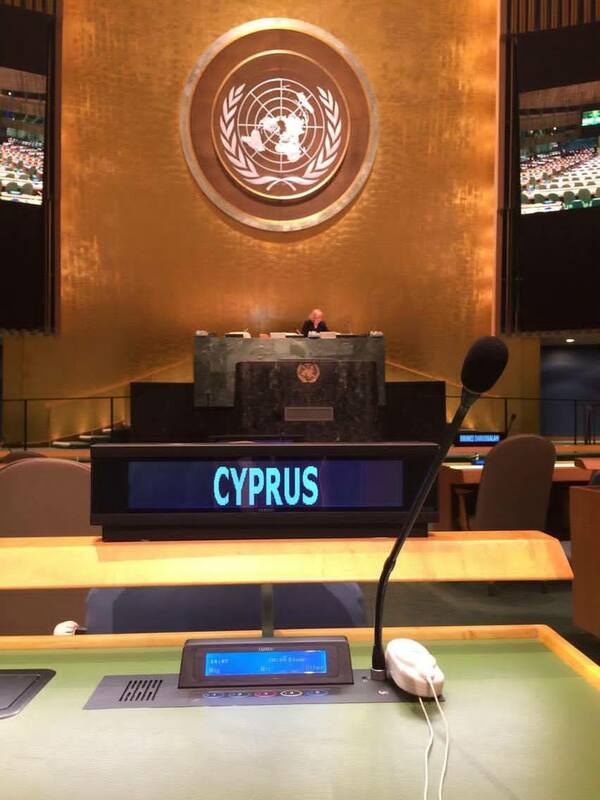 On a typical weekday, I would report to the UN HQ and attend meetings involving Cyprus and the majority of the other countries around the world. Due to current issues, Cyprus has a significant and substantial role to play at the UN; therefore, being part of the mission at such a point in time was very satisfying and fulfilling. My experience aided my understanding of Cyprus as a country but also of international law and politics in general. The hands-on approach this internship offered me is not something which can be overstated or experienced elsewhere. Overall, the internship offers a once in a lifetime experience which I feel privileged to have taken part in. Thanks to NEPOMAK, I had the amazing opportunity to work as an intern at the Permanent Mission of Cyprus to the United Nations. During the internship, I attended meetings of the United Nations Security Council, the United Nations General Assembly and the Committee on Peacekeeping Operations. After these meetings, I briefed Cypriot diplomats at the Permanent Mission of Cyprus to the UN and also wrote reports to the Ministry of Foreign Affairs in Cyprus to inform them of the most important developments that they should be aware of. It was fascinating to see how a small country like Cyprus plays an important role in some of the biggest issues in the world. Living and working in New York City was also an incredible experience and I look back with fond memories on my time there. I’d recommend this internship to anyone with a deep interest in international relations and diplomacy. I've been with the Mission for a week now and I absolutely love it! I've been to four meetings now within the UN, and in a couple of them I was the only one from Cyprus there, so it was really cool to be representing the country. The Secretary-General presented the meeting that I was in this morning which was amazing. I am getting on well with everyone at the office, they are all so lovely and I have learnt so much already. Thank you so much to NEPOMAK for this amazing opportunity.